- Eggs Mozzarella... scrambled eggs, fresh mozzarella, provolone and tomato, served with home fries and toast. - Amaretto Vanilla French Toast... In a special mixture of Amaretto, nutmeg, and real vanilla, thick french toast slices topped with sliced almonds and powdered sugar. We were so hungry, taking pictures were the last thing on our mind. Although it hit the spot, we thought the food was okay. We didn't know what to expect but after such an early morning, we just wanted something in our stomachs. After resting at the hotel with our breakfast coma, we set out on Boston's subway system, the T. It's actually America's first subway system and it seems like it's smoothly run even after all these years. We headed to Cambridge to take advantage of their free student run tours of Harvard. Our tour guide wasHarvard senior, Robbie, who did a fantastic job explaining the rich history, his personal student experience and adding his sense of humor to tie all the information together. The tour started at Lehman Hall, near where the University first beginnings started. When it was started, it was known as Harvard College. It was established in 1636 by vote of the Great and General Court of the Massachusetts Bay Colony and was named for its first benefactor, John Harvard of Charlestown, a young minister who, upon his death in 1638, left his library of 250 books and half his estate to the new institution. The college was strictly for men but eventually became co-ed when the enrollment of men was low. Next stop was the popular Harvard Yard. Above is a picture of the main gate from Massachusetts Ave. Harvard Yard is a grassy area that's known to be the oldest part and the center of Harvard University Campus. Surrounding the Yard are Freshman dormitory halls. We learned about the history of Harvard Yard including where some famous Harvard alum resided including Matt Damon, Natalie Portman, Tommy Lee Jones, and so many past Presidents. The picture below is Harvard Hall, which sits along the edge of Harvard Yard. The original Harvard Hall once housed the College library, including the books donated by John Harvard, after whom the college and the building were named—all but one of which were destroyed when the building burned in 1764. Harvard Hall now houses classrooms. We left Harvard Yard and went north across Cambridge St. where we learned about the Science Center. The Science Center was built in 1973 and serves as a major building on campus. Most students will have at least one class during their college career in the Science Center. Very different from the Harvard Yard buildings, The Science Center is rumored to be constructed to look like a Polaroid camera, this building was financed by Edwin Land, Class of 1930. He didn't exactly graduate from Harvard. He was a student but dropped out... and when he invented the Polaroid camera (along with being responsible for Polarized sunglasses) he was provided with honorary graduate degrees from not only Harvard, but other prestigious universities around the country. Do you see the resemblance of a Polaroid camera in the building? Just a short walk from the Science Center is Harvard Memorial Hall. Memorial Hall was erected in honor of Harvard graduates who fought for the Union in the American Civil War. The Hall is also one of the largest collections of Stained Glass in America, as seen in the beautiful windows below. Connected to the Memorial Hall is Sanders Hall, one of the largest lecture halls on campus. Connected on the other side of Memorial Hall is Annenberg Hall, a large freshman dining hall. Annenberg Hall. Named in memory of Roger Annenberg, '62 and inspired by the great halls of Oxford and Cambridge Universities, Annenberg Hall is arguably the most impressive space at Harvard. The hall covers an expansive 9,000 square feet. Architectural features include the great hammerbeam trusses, stenciled ceiling, and walnut paneling. Over the hall, on the east end, the imaginative stairway sequence leading to the tower meeting rooms works with the ceiling trusses and the polychromatic brick wall to create a myriad of geometric patterns. Annenberg Hall also houses a vast collection of paintings, sculpture and stained glass. Does this hall look familiar? Because it was designed to be similar to the great halls of Oxford and Cambridge Universities, it's similar to the scenes from Harry Potter (which used the great halls of Oxford and Cambridge Universities in the Harry Potter movies). Our next stop is the Widener Library. The Harry Elkins Widener Memorial Library is Harvard University 's flagship library. Built with a gift from Eleanor Elkins Widener, it is a memorial to her son, Harry, Class of 1907, an enthusiastic young bibliophile who perished aboard the Titanic. It had been Harry's plan to donate his personal collection to the University once it provided a suitable alternative to the outdated and inadequate library then located in Gore Hall. Mrs. Widener fulfilled her son's dream by building a facility of monumental proportions, with over 50 miles of shelves and the capacity to hold over three million volumes. The picture below only reflects the six floors of the library above ground. Below ground are four additional floors that were created. Amazing! Our last stop of our Harvard tour is the statue of John Harvard... or better known as the Statue of Three Lies. The statue, known by Harvard tour guides as the statue of three lies, claims that it depicts John Harvard, Founder, 1638, but in reality Harvard was a contributor, not the founder; the institution was founded in 1636; and the statue is actually a likeness of someone else. Crazy huh?! And as a lasting note from Robbie, on the statue is the Harvard emblem. If you notice, the three books on the middle of the emblem that reads Veritas within three books. The bottom book is faced down which is said to mean that Harvard students study with open books two-thirds of the time and are able to put their books down to enjoy themselves. After our tour, we asked Robbie where we could find a lobster roll at an affordable price and that lead us to Charlie's Kitchen. There, we met the cutest little waitress who sang Happy Birthday to our friend, Ruby. It was such a great little local spot and the prices were reasonable. Overall it was a fabulous way to celebrate Ruby's birthday! Afterwards, Teresa & Ruby continued their birthday celebration while I headed back to the hotel (that lobster did me in and I had a food coma that pretty much knocked me out - lol!) They enjoyed the views, martinis and dessert at Top of the Hub, a fabulous spot on Boston for great city views. I plan on visiting in the next day or two to check out the views myself too. Looks as though you guys had a great time!! Looks like you're having a great time! I love Boston. My dad and grandfather went to Harvard so we went there a lot when I was growing up. My grandmother grew up in Boston--and almost 70 years after she moved to Southern Illinois, she still has her accent! looks like you and your friends had a lot of fun! hopefully it wasn't too cold there! have you tried the clam chowder at legal seafoods? 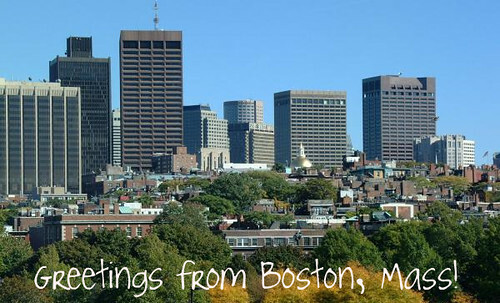 we had a lot of fun in boston a couple of years ago - pretty city! so much history there! What a great visit to Boston! I remember that dining hall quite well from a visit a few years back. The stained glass windows are impressive. Also impressive was the lobster dish. It's neat that it would be stuffed with scallops and crab meat! Yum!